The evening’s activities included a silent auction, and one of the items for auction was a gingerbread house from Grandma’s Bakery. 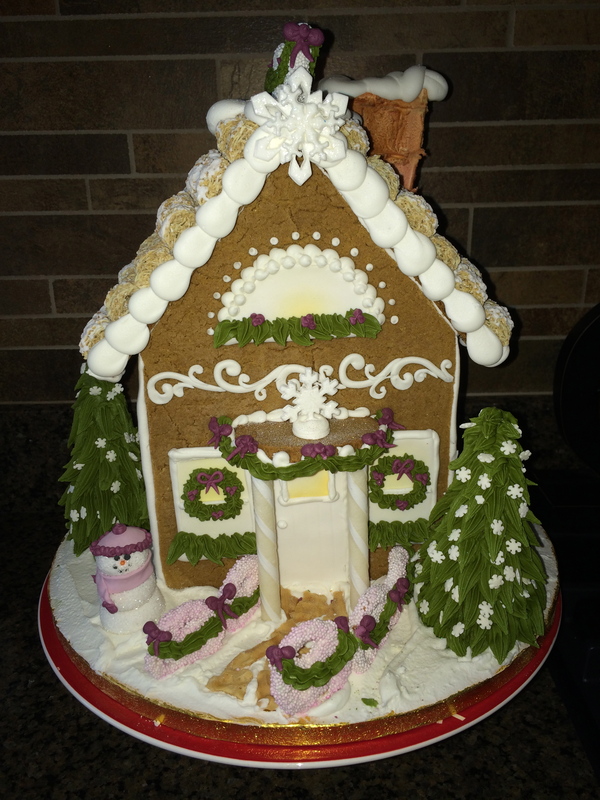 Now, this was no ordinary gingerbread house with graham crackers and gumdrops (not that there’s anything wrong with those); this one was a beauty. We were hosting a neighborhood Open House a few weeks later, so David and I thought it would be a great addition to the food table. Turns out, we bid the highest amount so we carefully carried our house of gingerbread to the car. Hmmmm … Yes, I knew it was gorgeous. But I, in my holiday frenzy, hadn’t taken the time to really look at the details. I hadn’t noticed the pretzels that had been dipped in candy and festooned with green icing to make a walkway that led to a perfectly appointed door. I hadn’t noticed the pine trees dotted with delicate candy snowflakes, the jovial snowman with a pink scarf and hat, the bric-a-brac, or the frosted shredded wheat cereal roof that was sprinkled with glitter. And, indeed, all eight windows had wreaths with pink bows and greenery. I missed it all. So I’m taking this lesson to heart this holiday season. I’m hoping to be more aware, to be more mindful of the little things, like the sound of David making coffee in the morning, my kids laughing with one another, or the sound of chattering when my family gets together on Christmas Eve (it’s probably at a much higher decibel rate, but you get the picture). I’ll try to notice the smell of the Christmas turkey in the oven, and really enjoy the taste of a sugar cookie instead of merely inhaling it. I’ll even try and smile when my almost-sixteen-year-old dog, Sophie, asks to go out for the 25th time of the day. So thank you, Mick. And thank you, wonderful artists/decorators at Grandma’s Bakery, for making me slow down and take in the details of this very special time of year.